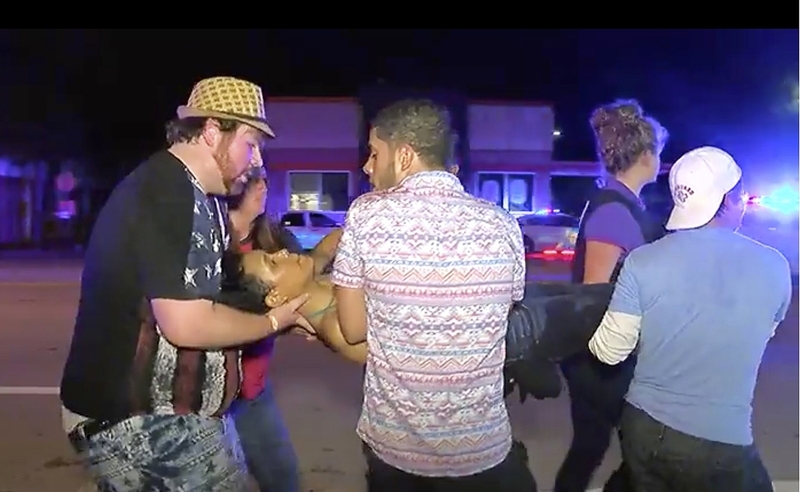 Newly Released Call Logs Reveal Chaos Inside Orlando's Pulse Nightclub : The Two-Way Victims called 911 as they heard and saw Omar Mateen shooting inside. The newly released records show Mateen holed up in the bathroom shortly after he started firing. Dispatchers counted the gunshots. An injured person is escorted out of the Pulse nightclub after a shooting rampage June 12 in Orlando, Fla. Authorities in Florida have released hundreds of pages of documents related to the mass shooting at a gay nightclub in Orlando that left 49 victims dead. The records reveal some of the deliberations of public officials after the shootings, and they also provide a disturbing window into how that night unfolded. Some of the records show that victims called 911 as they heard and saw Omar Mateen shooting inside the Pulse nightclub. Police dispatchers received the first report of a shooting at 2:02 a.m. ET. For the next 16 minutes, callers reported multiple shootings. They told dispatchers that they heard Mateen reloading, and on open lines, dispatchers counted the gunshots. At 2:09 a.m., one dispatcher heard 20 to 30 gunshots. Just a few seconds later, one of the callers goes quiet. The dispatcher notes: "My caller is no longer responding. Just an open line with moaning." At 2:18 a.m., the logs note the sound of gunfire. From then on, callers tell dispatchers that Mateen is holed up in a bathroom. The calls from victims inside the bathroom with him are harrowing. They report threats of bombs and they report that the condition of some of those who have been shot is deteriorating. At 2:26 a.m., one victim whispers to the dispatcher, "Please help." The records note that Mateen pledged his allegiance to the Islamic State at 2:40 a.m. They note that at 2:52 a.m., he "advised that 'he is a terrorist.' "
At 5:07 a.m., a dispatcher notes a series of explosions, meaning police were moving in. At 5:17 a.m., the log notes, "bad guy down." NPR's Caitlin Dickerson sifted through the text messages exchanged between city officials. They reveal that Fire Marshal Tammy Hughes and Fire Chief Roderick Williams discussed the safety of fire exits inside the club the day after the shooting. "In the texts, Hughes said photos taken that day show "one or two" of the exit doors inside Pulse were blocked by a coke machine. "Fire department officials told NPR they don't know when or how the coke machine got there. "According to text messages, the club has six exits, which Hughes said is an acceptable number for the club's occupancy load." In a statement, Pulse said that none of the six exit doors were being blocked the night of the shootings.